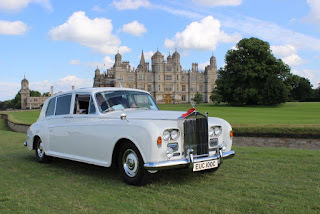 rally at Burghley House. Below: The Beatles second last photo shoot on April 9, 1969. 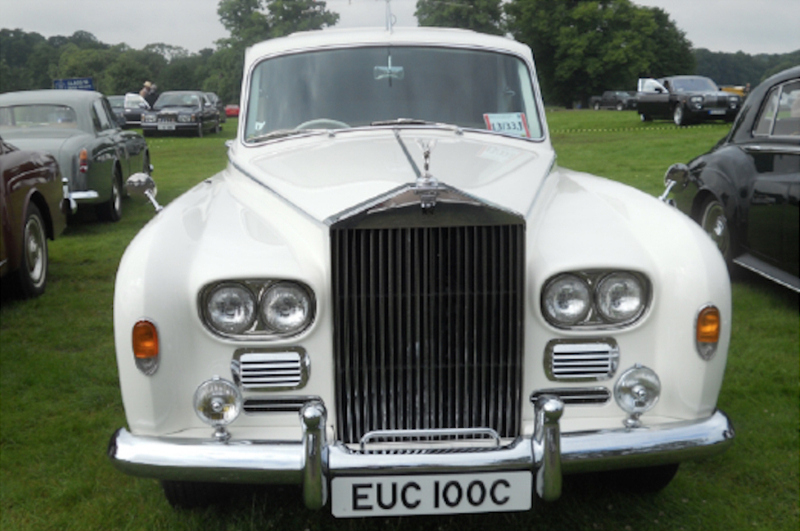 The understated reappearance in late June of EUC 100C, the famous white Rolls-Royce once owned by John Lennon (see previous post) marks the end of a thirty year period out of the limelight and an epic automotive restoration by anyone's standards. EUC 100C's current owner, Jody Klein, deserves the gratitude of Beatles fans and classic car lovers world-wide for rescuing this historic luxury limousine from the scrap metal yard. Over the last eight years, Rolls-Royce and Bentley Garages in Bromsgrove, Worcestershire, have painstakingly attended to every detail of the fifty year-old car. Both physically and in terms of performance, they have managed to preserve an increasingly rare example of the ultimate in Sixties motoring elegance. Some of the main restoration work carried out by RR&B Garages included rebuilding the engine and gearbox; steering and suspension; electrical system; air conditioning; television and audio system; stripping and repainting throughout; re-trimming the interior front and rear compartments; refurbishing timber and metal work -- in short, a full ground up restoration. Particular attention has been paid to the reconstruction of the rear compartment's entertainment console which Lennon had especially installed soon after he bought EUC 100C, around 1966/67. 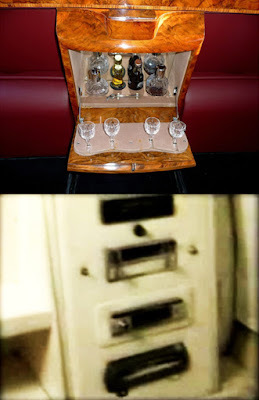 This audiovisual console replaced the more traditional drinks cabinet -- one of many luxurious refinements which came with every Phantom V. However, the two fold down jump seats on either side of the console were retained by Lennon, presumably so that extra passengers could be accommodated if need be. of the partition wall between driver and passenger compartments. 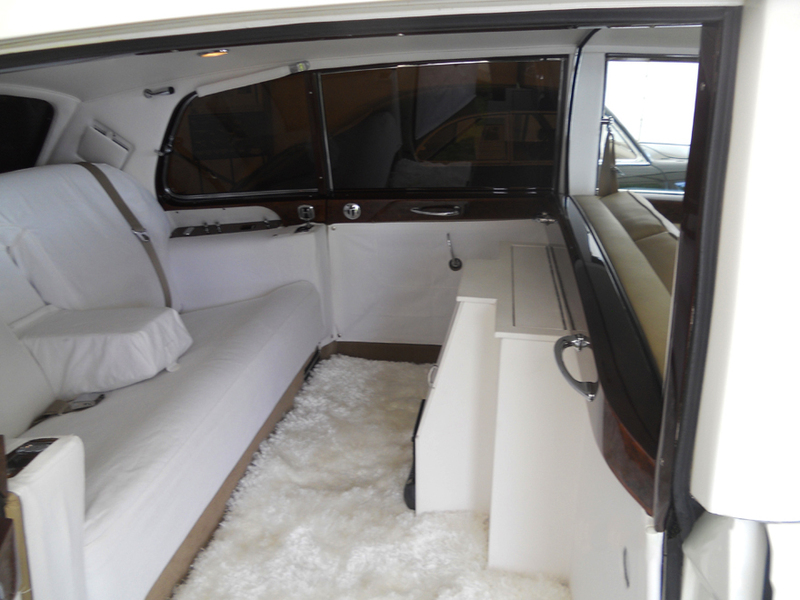 bespoke white cloth covers, faithfully replicated by RR&B Garages. As previously reported here, the exceptionally fine work carried out by RR&B Garages' small team of luxury car restoration specialists led by Alan Hobbs was appropriately acknowledged last month at the annual Rolls-Royce Enthusiasts' Club concours d'elegance and rally. 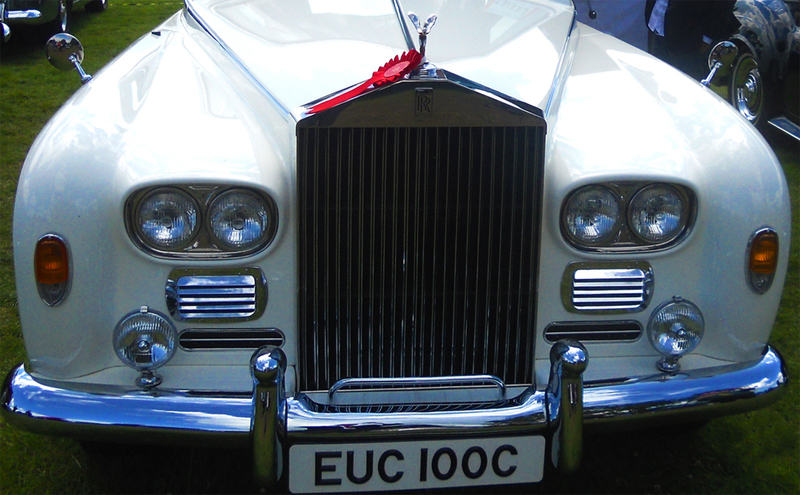 There is no higher public honor than the RREC's award of best in class for a classic Rolls-Royce such as EUC 100C. Its reception at its first public appearance in several decades must give Jody Klein cause for much personal satisfaction, and reflection. Should EUC 100C be permanently parked in a private garage hidden away from the world? Or, like Lennon's other Phantom V which resides in the Royal BC Museum in Canada, should the public be given at least some controlled access to one of the most famous limousines in Rock 'n' Roll history? Meanwhile, unanswered questions remain about EUC 100C's condition and whereabouts between 1970 – 2008. The little that we do know is roughly as follows. Thanks to the assistance of one of our readers, Paul Whalley, we know that according to Driver Vehicle and Licensing Agency (DVLA) records, EUC 100C's vehicle tax expired on October 1, 1986. 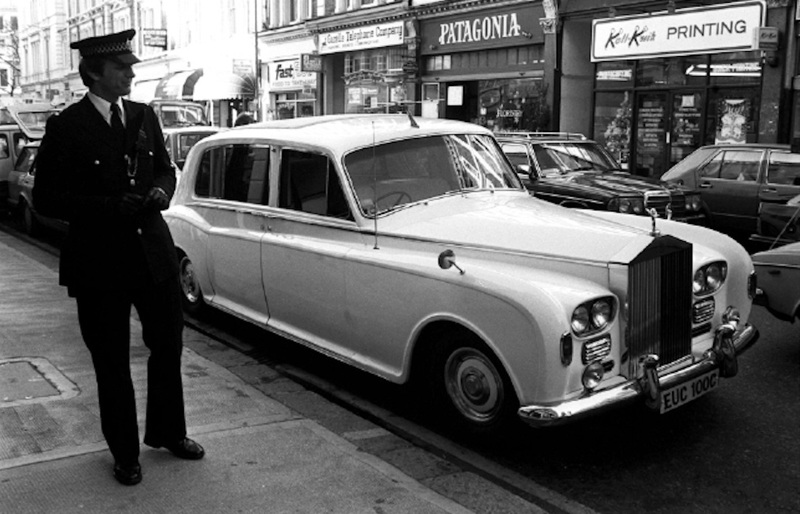 It seems that for many years John Lennon's old white Phantom V was existing in a state of limbo, neither legally drivable nor written off completely. How did such a prestigious, even notorious vehicle come to such a dolorous impasse? By the mid-1980s, EUC 100C's condition had badly deteriorated. After twenty years of service, apart from normal wear and tear, it is reasonable to speculate that more serious problems lay hidden underneath the body of the car. Still to this day county councils in the UK spend millions of pounds on gritting motorways with road salt during the winter. It is common knowledge that deicing roads with salt to improve transport safety also increases the incidence of vehicle damage due to rust. Functional and structural damage occur when corrosion causes loss of operating performance or structural integrity. Examples include perforation of body panels, corrosion of brake linings and deterioration of the frame and bumper support systems. Cosmetic corrosion affects only the appearance of the vehicle. Examples include rust staining of painted body panels and discoloration and pitting of trim metals. Special Report 235, Highway Deicing - Comparing Salt and Calcium Magnesium Acetate, Transportation Research Board National Research Council, Washington, D.C., 1991. John and Yoko on the road to Lavenham in the first week of December, 1969. 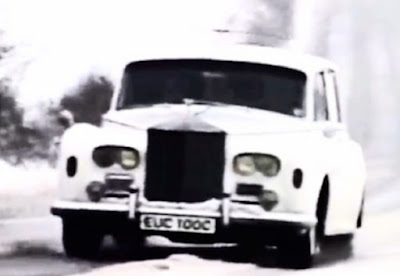 In contrast to the impressive spectacle of a white Rolls-Royce driving in a white landscape, it is evident from the footage that only one headlight is working. With so much else going on inside and around him, it would not be surprising if Lennon's second Rolls-Royce was less than perfectly maintained. After having made at least two trips to the Continent that we know of, by the end of the Sixties, EUC 100C may have been starting to look a little second hand. 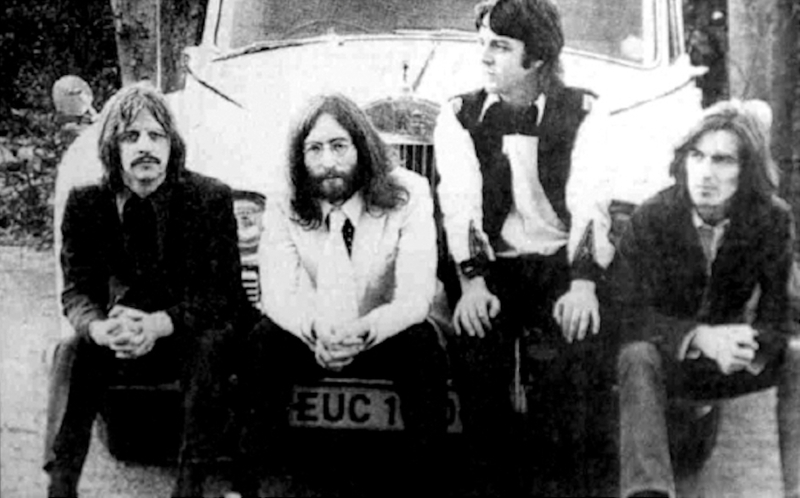 Also, given that the white Rolls-Royce had come to be publicly associated with The Beatles as a whole, the fact that Lennon had wanted to leave the group as early as October 1969, may have contributed to its redundancy in his life with Ono. So it was that towards the end of 1969 ownership of EUC 100C was transferred from John Lennon to Allen Klein, founder of ABKCO Music and Records and, for a while, business manager of the Beatles' joint enterprise, Apple Records Ltd. 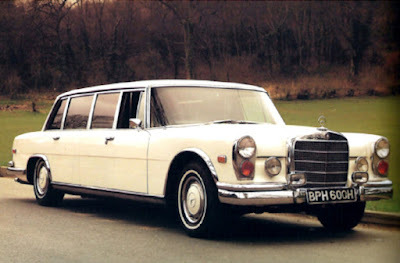 Meanwhile, during the last days of the 1960s, Lennon placed an order with Daimler-Benz in Stuttgart for a new Mercedes Pullman 600. Interestingly, Weaver states unambiguously that Lennon acquired EUC 100C in 1966. This is supported by an ITN news report produced in December 1985. His reference to “Hoopers” is also revealing. Hooper Motor Services specialized in the maintenance, coachwork repair and bespoke conversion of deluxe motor cars for the rich and famous. When Allen Klein bought the white Phantom from Lennon it must have needed expert attention to restore its original aura of exclusivity and indisputable elegance. Goodman's book tells us next to nothing about Allen Klein's activities in England after The Beatles disbanded, but we can assume that EUC 100C rarely left its garage throughout the 1970s. At this point in our investigation, exactly why Klein suddenly decided to sell his white Phantom V remains a mystery. On the 19th of December 1985, Christie's London held their first Rock and Pop Memorabilia auction. The proceeds, at least in part, were to go to the Samaritans. By far the most expensive item in the auction catalogue was Klein's white Rolls-Royce. On the day, however, the bidding was not as brisk as anticipated and the Phantom V was passed on unsold. The following year EUC 100C was deregistered and taken off the road. Road, South Kensington in December 1985. We don't know exactly where EUC 100C was and what happened to it over the course of the following two decades. There is some suggestion that for a while the car was sent to a garage in Wales for repairs and restoration. Lance McCormack of “Romance of Rust” fame is rumoured to have done some work on EUC 100C during the mid-nineties. Then, towards the end of the 1990s, Klein's white Phantom V received a full body respray before being placed in storage in a garage somewhere in the Luton area. Fortunately, the next port of call was Rolls-Royce and Bentley Garages in Bromsgrove in 2008. Eight years later, under the direction of Allen Klein's son, Jody, EUC 100C has been reborn. Those who have seen it first hand say that it not only looks like a brand new car, it drives like one as well. The restoration of EUC 100C is a testament to the vision and determination of Jody Klein, and a triumph for Alan Hobbs and RR&B's team of dedicated mechanics. May it long be a source of inspiration and wonder for car enthusiasts all around the world. best in its class at the 2016 Rolls-Royce Enthusiasts' Club Annual Rally at Burghley. If memory serves, lists used to be short. Now, lists are very long and hence have become dumber and dumber: instead of 10 items, for example, one can--perversely--list 11 (apparently some missed the joke in This is Spinal Tap) by using the alibi of the “tie”: two (presumably) rare and singular objects cannot, paradoxically, be sufficiently distinguished. Or, alternatively, you can choose to do what Rolling Stone magazine recently did with its list of the 50 Best Albums of 2015. Since critics do not want time--the final judge--to prove them wrong, their “Best Of” lists get longer and longer as a way to hedge their bets. The “50 Best” list also reveals the extent to which Rolling Stone has developed what might be called a homogeneous “house style,” because while no authorship is attributed to the piece and no single author could have possibly written all 50 entries, the style remains consistent throughout. So much for the critical acumen and perspective of an original, distinctive critic--this is a list by committee. Perhaps this list by committee suggests that with a large stable of writers, you have to keep them all busy, so the solution by the management is to order the list to be very long in order to give them all something to do. Of course, Rolling Stone is no different than any of the other powerful media institutions, which all feel compelled at this time of year to engage in some sort of tremendously dumb historical rundown. Hence, one cannot avoid the connection between language and power. As Robert Christgau observed about 15 years ago, the idea of a rock canon is a complete absurdity. Still, the notion of a rock canon hangs on, a consequence of the powerful connection between music and memory. As he says, “Canonization is institutional. The Rock and Roll Hall of Fame is a canonizing institution.” What was once a game played by the idle rich has become an instrument of institutional power, and as Christgau indicates, Rolling Stones uses its economic power to enforce a canon—as perverse as it is ludicrous. Once more, all the “Best of” lists being issued this time of year reveal how we live not in an age of axioms (universally accepted truths that are potentially falsifiable), but in an age of aphorisms (statements of personal taste). It grieves me to report the sad news that my friend Frank Mazzola, who became one of the most influential film editors of his generation by virtue of his re-edit of Donald Cammell and Nic Roeg's PERFORMANCE (1970), died on January 13, 2015, at the age of 79. The following obituary was written by Catherine Mazzola. It is a wonderful tribute to a great man. Frank was born and raised in the heart of Hollywood surrounded by the film business, his father being the first contract player at Fox Studios. Frank worked as a child actor, appearing in such films as The Hunchback of Notre Dame (1939) starring Charles Laughton, Always in My Heart (1942) with Walter Huston, Casablanca (1942), and Joseph Losey's The Boy with Green Hair (1948). Frank went on to study acting with Stella Adler and Jeff Corey and did theater at the Beverly Hills Playhouse. He was cast in a part of a high school student in Elia Kazan's East of Eden (1955) before being accepted into the University of Oregon on an athletic scholarship. Frank left Hollywood behind but only briefly. On a school break, he auditioned for a role and was cast as "Crunch" in Rebel Without A Cause (1955), directed by Nicholas Ray and starring then-unknown James Dean. Because of his reputation from his days in the Hollywood High club, The Athenians, Frank was approached by Nick Ray and David Weisbart, Rebel's producer, to help recreate a reality about rebellious teens from middle class families. Frank was given an office at Warner Brothers, and according to Rolling Stone magazine, "he ended up helping director Nick Ray and screenwriter Stewart Stern shape Rebel into an accurate piece of 1955 sociology." Frank was instrumental in selecting Jimmy's '49 Merc and his famous red jacket, which was not unlike the original Athenian club jackets; and one of the Nick Ray biographies quotes, "...the knife duel between Jim and Buzz (Corey Allen) was staged with the aid of Frank Mazzola." Nick summed it up by signing a Rebel poster with a personal note of thanks, "For Frank Mazzola who helped so much to make the texture of Rebel into a living reality." Having participated in the creative aspects of production on Rebel, Frank decided to pursue his love of film from behind the camera. Inspired by Nick Ray and David Weisbart, who had edited A Streetcar Named Desire (1951), Frank chose editing to learn the process of filmmaking. As an assistant at Universal Studios, he was involved with Hitchcock's Psycho (1960) and Stanley Kubrick's Spartacus (1960). Following, he assisted at Fox Studios and The Mirish Corp., learning some of his most valuable lessons from working with Ralph E. Winters as the first assistant on Blake Edwards' The Party (1968). After creating artistically beautiful and complicated montages that received excellent reviews, Frank began his career as an editor on films such as Macho Callahan (1970), Stiletto (1969), and a re-edit of La Piscine (1969). Frank was then sought out by film director Donald Cammell to create montages and re-edit Performance (1970), a film that was sitting on the shelf at Warner Brothers. Frank's work with Donald on Performance (1970) led to the film's release. It went on to receive cult classic status and according to The British Film Institute, "Performance is one of the most extraordinary British films, and arguably the greatest." Frank's career as an editor excelled from this point forward with films such as Peter Fonda's directorial debut, The Hired Hand (1971), Donald Cammell's Demon Seed (1977), and A Woman Called Moses (1978) starring Cicely Tyson with narration by Orson Welles. The Second Coming of Suzanne (1974), which Frank co-produced and edited, won three of the top ten awards at The Atlanta Film Festival including the gold medal for editing. Frank loved the artistry and creativity of filmmaking. As Rex Reed wrote in The New York Daily News, "Frank Mazzola, the excellent film editor, has attempted to do something different with film." Stanley Kauffman of The New Republic wrote, "Mazzola has used almost the whole contemporary editing vocabulary." Other reviewers have written that Frank is, "a master craftsman at film editing," he "creates a perfect sense of pacing," and his "montage sequences rate spontaneous audience applause." 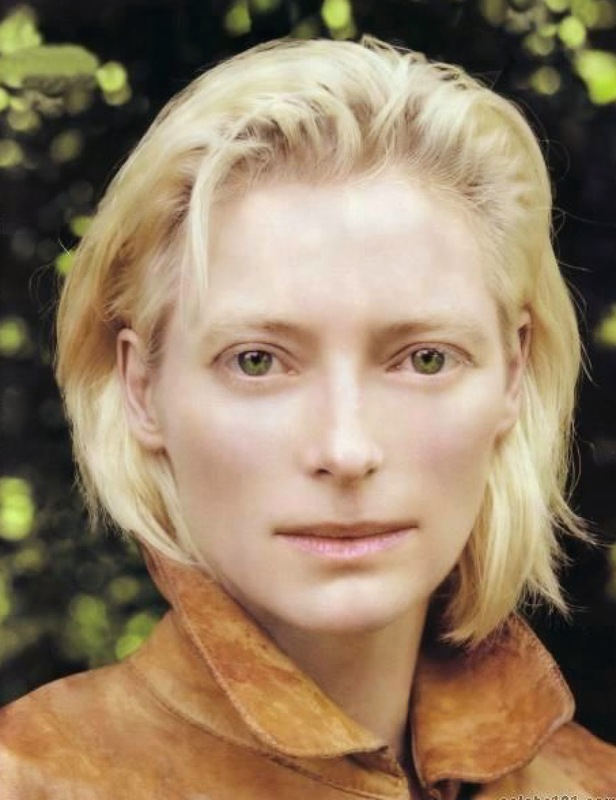 As quoted from the Stratford Film Festival: "The exhilarating beauty of the color cinematography and visual wizardry of the many montage sequences establish cinematographer Isadore Mankofsky and editor/montage artist Frank Mazzola as two of the world’s finest artists in their respective fields." In 1999 Frank completed production on restoring and editing a Donald Cammell short, The Argument (1999). Video Watchdog wrote "the film is a surreal gem...abandoned, once lost, now found, The Argument, like the Phoenix, has been reborn." The screening of the short became the catalyst for Tartan Films and London's Channel 4, to join forces with Frank on the restoration of The Director's Cut of Donald Cammell's Wild Side (2000). Following the Wild Side premiere at The Edinburgh International Film Festival, Peter Bradshaw of The Guardian wrote: "Perhaps the most remarkable event of the festival has been Wild Side, the last film by the late Donald Cammell, presented in a radically new director's cut, lovingly prepared by editor and long-time associate Frank Mazzola...Under Mazzola's microsurgery, it emerges as classic cinema..."
In addition to Frank's behind the camera career, he has appeared in numerous documentaries about Donald Cammell and James Dean, most notably Donald Cammell: The Ultimate Performance, the American Masters series, James Dean: Sense Memories and as a special guest on Larry King Live. Throughout his life and career, Frank remained committed to the dedication of his time and creative energy as an independent force in maintaining film as an art form. 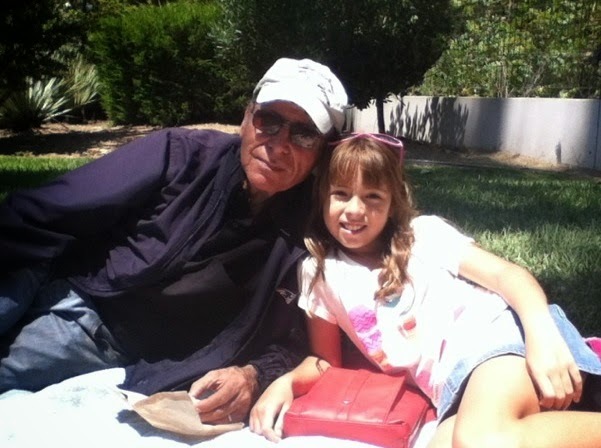 Services will be held at 11:30 a.m. on Saturday, January 31st at Blessed Sacrament Church in Hollywood. In lieu of flowers, a memorial donation fund has been set up by Frank's oldest daughter at IndiegogoLife/FrankMazzola Memorial Fund. Note: This blog is an amalgam of observations I've made previously, with a few additional remarks added. It seemed appropriate to (re)publish some of these observations given the occasion of Elvis's birthday. Today would have been Elvis Presley’s 80th birthday. His death occurred over 37 years ago, but he lives on, and not only in the form of impersonators. Greil Marcus calls the image of Elvis who lives with us now the dead Elvis, and even wrote a book about it with just that title: Dead Elvis: A Chronicle of a Cultural Obsession (1991). Marcus called this Elvis “an emptied, triumphantly vague symbol of displaced identity” (p. 33), but it also happens to be the condition of the android, the experience of the ghost having left the building. You can find this Elvis on coffee mugs, ashtrays, crushed black velvet, ties, T-shirts, scarfs, wine labels, billboards, Pez dispensers, limited edition dinner plates, clock faces, and appropriated for album covers. You can find it all over. The image is ubiquitous. Elvis’s meteoric rise to fame roughly coincided with the new technology of television, so in a sense Elvis has always been an image. For those who may care that today would have been his 80th birthday, Elvis Presley will always be a daunting, elusive mystery. In Dead Elvis, Greil Marcus calls the invention of dead Elvis “a great common art project, the work of scores of people operating independently of each other, linked only by their determination to solve the same problem: who was he, and why do I still care?” Because dead Elvis is a collective representation, it both legitimizes and subverts “Elvis” the man. Perhaps the whole issue is irrelevant, except that Marcus can’t get past the vast amount of cultural expenditure invested in constructing dead Elvis. Nor can I. For now, dead Elvis is largely perceived as an exemplar of tastelessness and an example of what comedian Tom Arnold once said about his marriage to Roseanne Barr, “We’re America’s worst nightmare—white trash with money.” What are the reasons behind this cultural perception of dead Elvis? Because societies can suffer from amnesia just as an individuals can, the specific meanings of “Elvis” no longer exist. 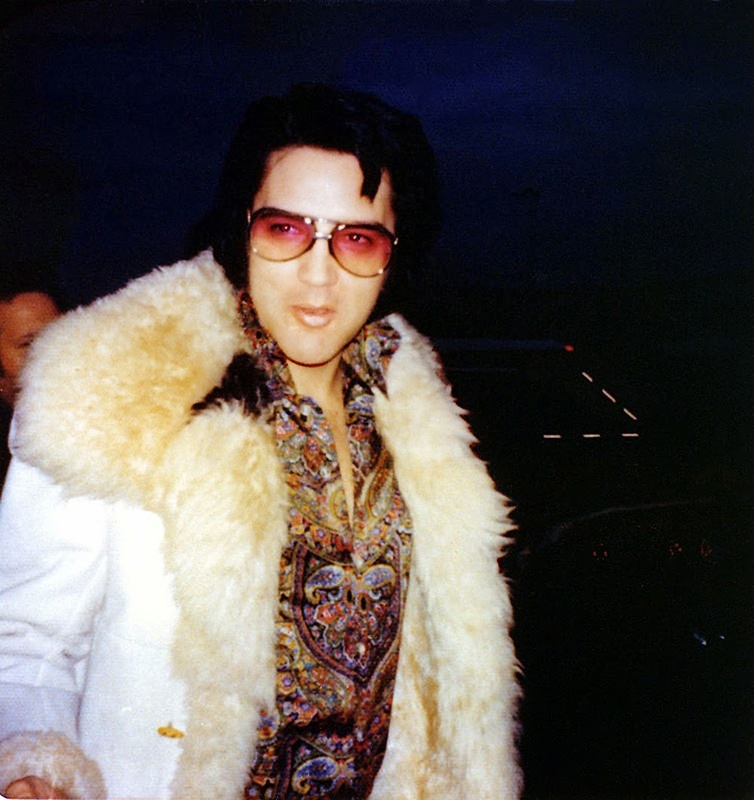 Many young people today know Elvis is a rock star only because they have read that he was one. For Robert Ray (also from the South), writing in The ABCs of Classic Hollywood, dead Elvis is a grand example of a celebrity “whose fame, even at its its peak, is inseparable from camp.” He doesn't write that with glee.